South Sudan the world’s youngest nation, and neighbor to my home country of Ethiopia, is full of promise and I was thrilled to have six days to discover the city of Juba. Lagu Samuel met me at the airport; I met Lagu in Berlin in 2013 at re:publica which is world’s largest digital culture conference in Berlin. So when he barely recognized me at the airport, I wasn’t surprised. That trip in 2013 was Lagu’s first trip to Europe and nothing could prepare him for the Deutsch Labor day festivities on May 1st — his birthday. My first trip to Berlin was on May 1st, a year earlier and so not only did I understand his shock, I also had a similar experience. Our first stop from the airport was an Ethiopian restaurant on a dirt road in Juba. The Habesha waitress spoke Amharic and if not for the temperatures outside, I might as well have been back in Addis — I later learned that a significant number of restaurants in Juba are owned by Ethiopians. This was ironic given that I heard from Juba for the first time from a Canadian friend, Stephen Kovats. Lagu often referred to Stephen as the man who beats the drum when it comes to innovative ventures in South Sudan; as a big believer in open society and open source, his company r0g_Agency has been spearheading the promotion of open culture in South Sudan and beyond for over 3 years. That first lunch in Juba with Stephen and Lagu allowed us to reminisce on how many times we talked about South Sudan; it was fitting that I was finally visiting and ready to meet Lagu’s team to support them to set up their new innovation hub. Located one hour away from the airport, jHUB is Juba’s open knowledge and innovation hub and is led by a team of young visionaries like Lagu. Lagu is no typical hub guy: he is studying medicine, learned how to use a computer from his employee and is the founder of Kapital movie industry cooperation, the organization behind jHUB. During my stay in Juba, I worked with the Kaptial core team and the first hub community members to define jHUB and set up a workplan. Stephen and Lagu are organizing the #peacehackcamp, the first activity of jHUB slated for November 30 to December 2, 2015. 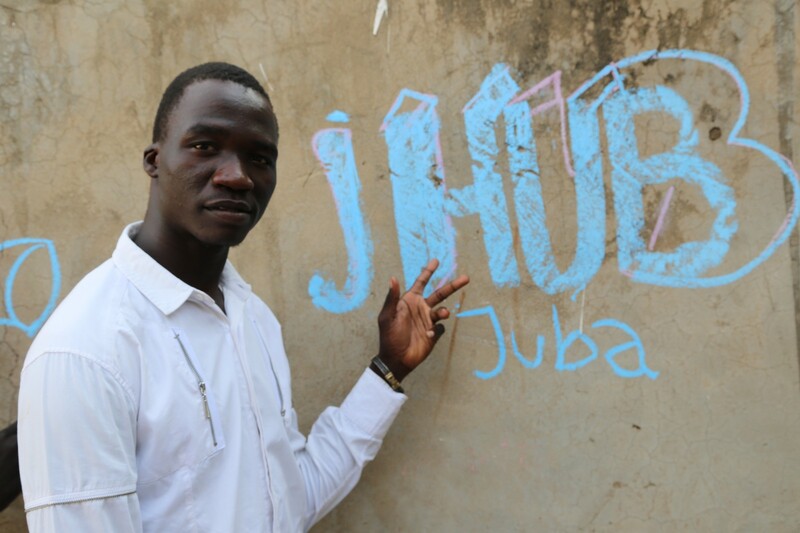 You would never understand the depth of the word “peace” until you visit Juba. It’s on everyone’s tongues: people talk about “peaceful competitors”, “peace hackathons” and “hand wash for peace”. You do everything for peace in South Sudan. You live for peace. It is indeed true that when people live in the absence of peace, they think about nothing but peace. Working with Lagu and Stephen, I felt confident that their small community innovation hub would contribute to peace in Juba. The entrepreneurial eco-system in Juba is not different from what we have in Addis Ababa which is why at iceaddis we are pushing to make things easier for tech startups in Ethiopia, despite the various challenges we face everyday. When Stephen invited me to come to jHUB I knew that I wouldn’t be surprised by Juba’s eco-system. As the youngest nation everything is in its infancy and yet, it holds untapped potential because of its active youth. Emmanuel Mbisimo Victoris, 23, is one of the students at Kapital and the first member of the jHub community. 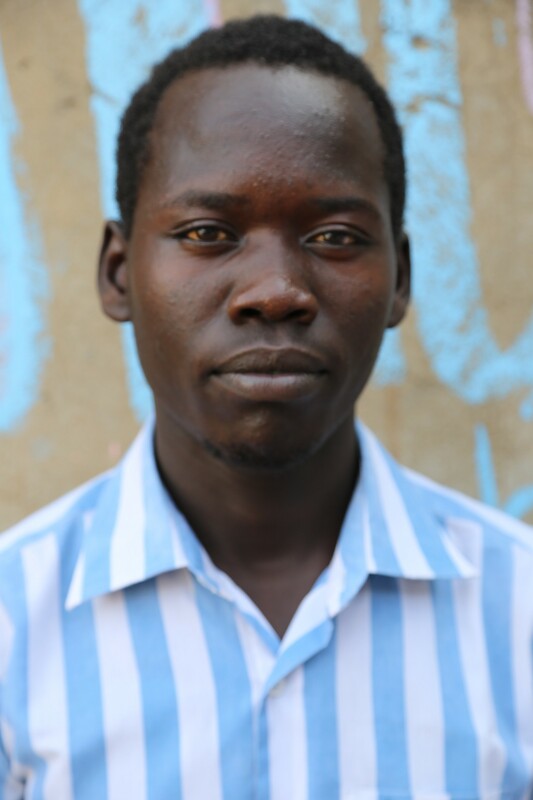 Emmanuel studied information technology and like many South Sudanese I met, he lived and studied in Uganda. He spoke a lot about building his own company, even while the whole country mostly thinks and talks about peace. I asked Emmanuel why he wanted to come back from Uganda. He told me his father didn’t want him to return to South Sudan but he said, “this is my country, my home”. Emmanuel and his team founded a tech company that specializes in software development and hardware troubleshooting. It is definitely not easy to run a startup company in Juba: there is limited support for skill development, the competition is not also well regulated, and with most companies based in Kenya, Ethiopia and Uganda dominating the business scene, there is little for South Sudanese youth (even though they are the ones who shall stay in the for the good and bad of times). The state doesn’t provide power. Everyone in Juba needs to find their own means to meet their power needs; Emmanuel pays 500 SS pounds ($85USD) for the shared generator for his small company and is planning to consider solar energy given that state-provided electric power is out of the question for now. That is one of the reasons why jHUB is vital to provide a space for young entrepreneurs with access to Internet, electricity, a network and a working space. Emmanuel told me that all his friends want to work for the UN or the government. He saw the potential of the hub to change mindsets and promote entrepreneurship; he believes jHUB shall bring and connect people together regardless of gender or tribe to share ideas that promote peace and unity. Jaiksana is a student now, but already organizing events at jHUB to support his peers. JHUB just started operations and has more than fifteen (15) pioneer members from the local community. Their first big task is to organize #peacehackcamp: an intensive media literacy and inter-communal peace-building project that taps into open source tools and media for their ability to promote collaborative enterprise in learning and innovation; foster mutually beneficial interaction among communities; enable shared ownership and effectively distribute gained knowledge. The challenges of establishing a technology eco-system in South Sudan are far from over but the opportunity, talent-base and passion of people like Lagu and his team will put South Sudan on the innovation and technology map. As for myself, I am looking forward to the honor of being part of jHub’s journey to transform South Sudan.